Beets are the best! Forget about the canned version you were served as a child, when cooked fresh, they taste amazing! At 75 calories, per serving you really can’t beat this superfood rich in Vitamins A, C, and Folate. They also provide a healthy dose of calcium, magnesium, phosphorus, and potassium. Enjoy some of our favorite beet inspired recipes including a dessert that mixes beets with pomegranates. Cut the stems off the beets. Place them beets in a microwave space bowl covered in water and cook for 5 minutes. Let the beets cool and cut off the skin of the beets and chop into cubes. In a food processor, combine beets together with chickpeas and pulse for 2 minutes. Add in lemon juice, tahini and olive oil and continue to pulse for an additional 2-3 minutes or until creamy. Refridgerate 30 minutes before serving. Makes 4 servings. Preheat oven to 375 degrees F. Remove stems from beets and coat lightly with olive oil. Wrap beets in foil and roast in oven for 1 hour. Remove from oven and let cool. Place each beet in a paper towel and gently remove skin (the paper towel help keep your hands from turning pink). 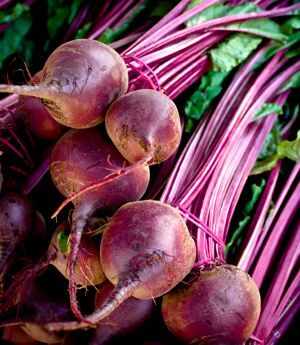 In a large bowl, toss beets, celery, cucumber and green onions. To make dressing, whisk olive oil, lemon juice, basil, salt and pepper in a small bowl. To serve, toss vegetables with arugula and salad dressing. Top with avocado and seeds. Makes 1 serving. Preheat oven to 375 degrees. Line a casserole dish with aluminum foil. Combine beets, carrots, and onion in a casserole dish. Pour apple cider vinegar over vegetable mixture and stir; season with salt and pepper and garnish with rosemary. Cook for 45 minutes or until beets are golden brown. Makes 4 servings. Preheat the oven to 400F. Dice the apples, shred the beets and remove the seeds from the pomegranate. In a glass bowl, lay the diced apples to the bottom, then sprinkle the pomegranate seed on the apple, follow by the shredded beet. Sprinkle the cinnamon over the top. Heat up the water, sugar, vanilla and coconut oil in a sauce pan until it starts boiling. Then, remove from heat and pour the oat flakes into the syrup. Mix well and pour the oat mixture onto the fruits in the bowl. Place into the oven and bake for 30 minutes. Makes 8 servings.